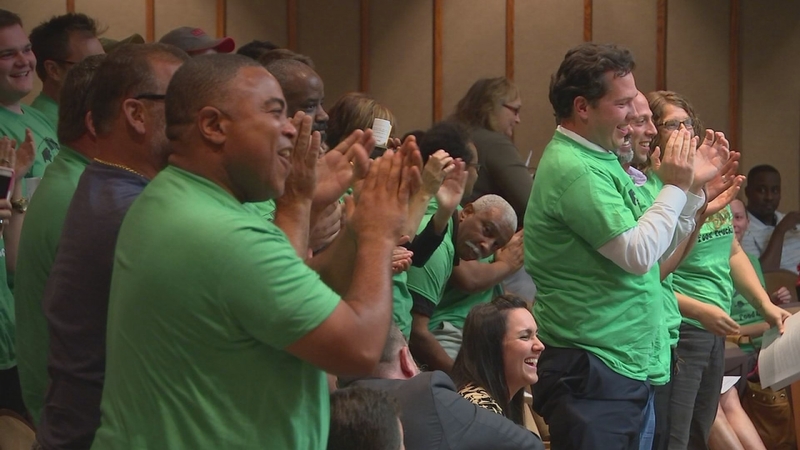 RALEIGH (WTVD) -- City council members received a standing ovation in Tuesday night's city council meeting after they approved allowing food trucks in mixed use neighborhoods. Jessica McCarthy owns the Humble Pig Food Truck. She and a group of fellow food truck owners were concerned about how their businesses would survive under the proposed city-wide Unified Development Ordinance (UDO). The rezoning expands the area food trucks would be allowed in by more than 1,000 acres. McCarthy said they would have access to the office and warehouse districts, but she's not sure how successful they would be in those areas. "With the warehouse you're talking trucks 20 to 28 feet in length, we already have limited parking down there, where are we going to go," said McCarthy. "Those aren't really the areas we like to focus on, which in the industry we call the food deserts, those are without restaurants still highly walkable because of churches and residences but they don't necessarily have any food there." Another big issue under the rezoning would have been not being able to work in what's called NX areas, which are "neighborhood mix use zones", neighborhoods near businesses. "Almost gives us the exposure we need to create the jobs my husband and I set out to do. He was laid off in 2011, and that's why we started this whole thing, so we want to be able to create as many jobs as possible - jobs that pay living wages and being in those types of zones, near the neighborhoods," said McCarthy. When Travis Krane with city planning told the council that the only reason the change was ever made was due to something consultants had suggested, the council voted unanimously to allow food trucks in NX zones. Those in the bar and restaurant business living under the new downtown rules also addressed the city council. They say the rules that keep them from serving on city sidewalks past midnight Sundays through Thursdays and 1 a.m. on Friday's and Saturdays, are not working. One woman took the podium to tell the council that she works two jobs, one at Citrix and the other at Coglins, a downtown Raleigh bar and nightclub. She said since the new rules have gone into place she's thankful for both jobs. "With the new rules and regulations and chosen enforcement I would not have been able to pay my bills this past month without that second job," said the young woman. "The amount of income I've lost since this has all started between losing shifts and patrons is almost staggering." Alice Weber works at Paddy O'Beers and said the purpose for the new rules is not helping keep downtown quiet or cleaner in the early morning hours. "It's not reducing noise, keeping people quiet or sending patrons home early," said Weber, who also argues that most of the trash on city sidewalks is from food containers and not from bars. Raleigh's Deputy Chief, JC Perry said he has a special force assigned to making sure bars and restaurants adhere to the new rules. He said they've already issued 43 warnings to 30 businesses. "Mostly what we're seeing is serving outside without a permit, not maintaining minimum sidewalk clearance," said Deputy Chief Perry. Weber and several others who spoke on this issue say they feel those patrolling the streets are not consistent with what is against the rules and what's not. Council members say they will take all these issues into consideration when they revisit the ordinance in November. Council members voted to move forward with a plan that would bring more parking to Raleigh's Warehouse District. The move would also bring new business to the area. In a 5- 0 vote, the council voted in favor of moving ahead with a parking deal with Kane Realty, the company is working on a development project that includes at 17 story tower. John Kane, Chairman and CEO of Kane Realty Corp. is planning the commercial and residential development project near the old Dillon Supply Warehouse between South West Street and South Harrington Street. City leaders are choosing to enter into a public-private partnership to develop public parking to support the Raleigh Union Station and other development in the Warehouse District. The terms of the agreement have the City of Raleigh acquiring up to 350 parking spaces at up to $32,500 per space. According to the city council agenda, partial payments will be funded by the Parking Enterprise fund and other funding sources if necessary. While the city council gave the go-ahead on the project, they will still hold a public hearing. That's scheduled for October 7. Council members also voted in favor of granting $6,800,000 in bond funds to help the Downtown Housing Improvement Corporation to develop property just east of Downtown Raleigh. The first phase of the project is Washington Terrace, which was originally a 245 unit affordable rental development. It was built in 1950 and Larry Jarvis with Housing and Neighborhoods told the council the area is in need of a new look. The DHIC purchased the property in January 2014 and is now ready to develop 162 units. "Being able to do 162 units with this one place, I think that's more than the city has done in a year, so it's a substantial step forward," said At-Large Council member, Mary-Ann Baldwin. "If you look at the city's per unit investment, the fact that we're creating an affordable unit for just under $42,000 is pretty significant," said Jarvis.